Duration - Expecting your dog to remain in a stay position for longer periods of time makes the exercise more difficult. Distraction - Expecting your dog to perform any skill in the presence of other people or animals is more difficult than when you and your dog are working alone. DIstance - Expecting your dog to perform over longer distances provides more challenge. 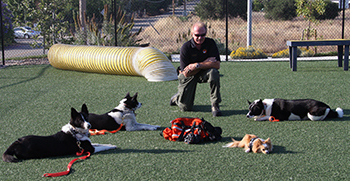 Even if you consider yourself an experienced dog handler, group obedience classes may still play a role in your training program. Group classes is one way we ensure that our Karelians have ample opportunity to practice their skills under conditions that can be difficult to create at home. Above, can you find all three Karelians? 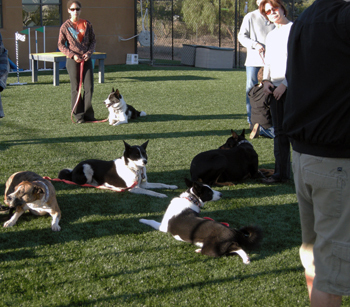 Group classes provide opportunities to socialize your dog with other dogs. The classes also serve to expose our Karelians to a high degree of distraction as they practice their skills. Below, three-month-old California Karelians' Mishka is attending her first dog obedience class, learning to walk along despite the distraction of the other dogs in class. Let's assume that at home you have introduced your dog to the basic stay command and are now ready to increase the level of difficulty. Let's look at how we can introduce the three D's. Duration. Gradually expect your dog to lay down beside you and stay in position longer before you release your dog. Remembering that duration is a separate element of difficulty from distraction or distance, you will want to introduce the challenge of increased duration while minimizing distractions and remaining close to your dog. So, you will begin by simply standing beside your dog for increasing durations of time before releasing your dog. Distraction. 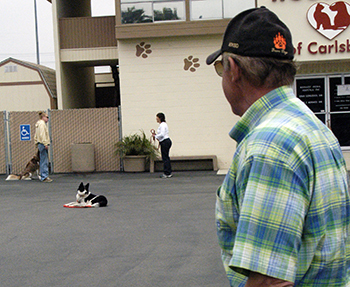 Distraction can intentionally be created by you (if you and your dog are training alone) or will naturally be created if you move to an environment where the dog will train in the presence of other people or dogs. Once your dog is in a stay, you can begin to introduce distraction by dropping the leash slowly, then walking around and stepping over your dog before returning to the dog's side and releasing him. The fact that you are moving while your dog is expected to stay in position will create a distraction for the dog. Remembering that distraction is a separate element from distance or duration, you want to avoid making the exercise too difficult initially. So, you will begin to introduce the challenge of distraction by keeping a close distance to your dog and creating the distraction for only a short duration of time. 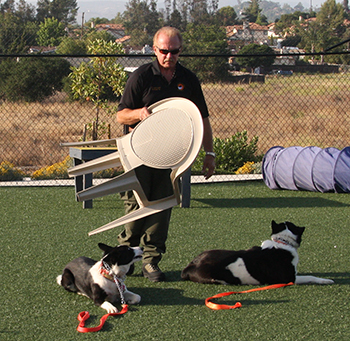 Add a second dog to the exercise (above) or carry a chair as you walk around the dog, and you have made the distraction even more challenging. Now, for an even greater challenge, combine the duration and distraction challenges. Walking around and over your dog multiple times creates the distraction for a longer duration. Then, you might try adding more dogs, remaining close by at first. Kneeling is, again, creating more of a challenge, because the dogs may interpret the act of kneeling as a release from the stay. 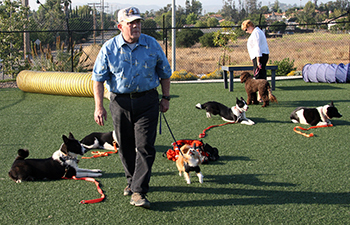 Training in the presence of other people and other dogs, say outside Starbucks or in a dog obedience class, adds additional elements of challenge. 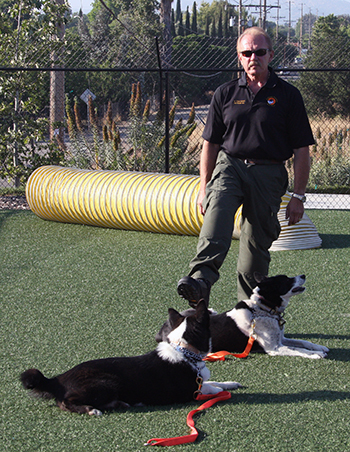 At first, the handler should remain nearby, because as the handler puts more distance between himself and his dogs, the third D, Distance, is being introduced and the exercise becomes very advanced. Below, four Cailfornia Karelians are remaining in a long stay, despite the distraction of other dogs walking nearby. Distance. Now, assuming your dog is willing to "stay" under distraction for longer periods of time, you can introduce the challenge of distance by putting more distance between you and your dog as he stays. Remembering that distance is a separate element of difficulty from either distraction or duration, you will want to introduce the challenge of increased distance while minimizing both the amount of distraction and the duration of the stay. So, you will begin to introduce the challenge of distance by merely increasing the perimeter as you walk around and over your dog before returning to his side and releasing him. Eventually, you can shorten up the distance somewhat but increase the number of times you walk around your dog and even stop to chat with someone before returning to your dog's side and releasing him. Then, gradually increase the distance (which also creates longer duration, as it takes you longer to walk further away), still under distraction. As you perform these training exercises, please keep in mind good handling techniques. Your tone of voice, the body language you use, your timing in working with your dog, and your ability to motivate and reward your dog will all affect your dog's learning speed and success. 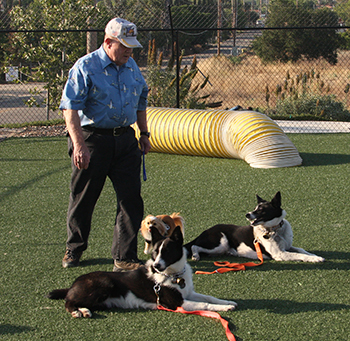 Below, four California Karelians remain in a stay for a long duration, under the distraction of other dogs nearby, while Bill, their handler, has put distance between himself and his dogs. (He is no longer in the field of vision). 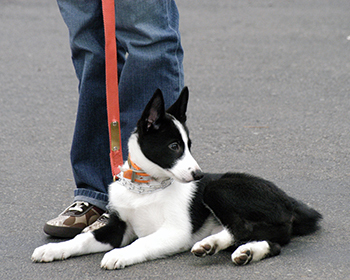 Below, 4-month-old California Karelians Mishka is participating in an Intermediate Level dog class. 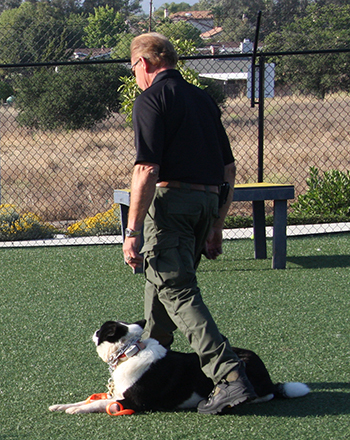 Bill (her handler) used a pack (with Bill's scent on it) to designate for her that her job was to stay in that spot as Bill walked far away from her after giving the stay command until releasing her with a come command. (Substituting a hat or jacket for the pack works equally well, as long as it has your scent on it.) The pack helped to define the place where Bill wanted to stage her for a long stay (duration) under the distraction of the other people and dogs in the class (distraction) as he walked away from her (distance). 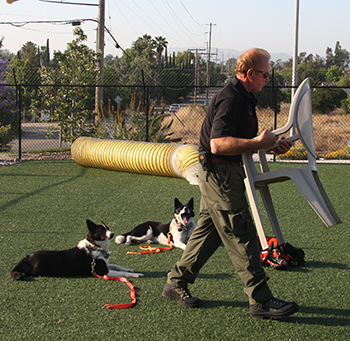 Let's demonstrate how to maximize your Karelian's challenge by practicing all three types of training challenges and combining commands. 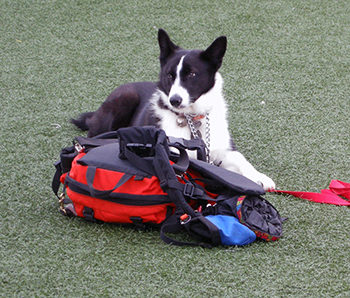 Try putting your Karelian in a "stay" (the first command) during an obedience class with other dogs and handlers nearby (for distraction), walking away (adding distance), and expecting her to stay (duration) until you call her to you (the second command). Now, below, you have introduced all three challenges plus a second command, the "come" command. as distance is put between the handler and the dog. the duration of time that the dogs are expected to stay until the handler returns to them and releases them.